With a carbide tipped cutting edge for ultimate durability, and a ball bearing guide for precision, Whiteside router bits give you the performance you need to complete any project. For your convenience, we offer Whiteside corner beading router bits in a variety of shank sizes, diameters, cutting lengths and radius. 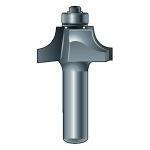 View our selection of corner beading router bits below and add to your Whiteside router bits collection today. 1/4" 1/2" 1-1/4" 2-3/8" 1/2"
3/8" 5/8" 1-1/2" 2-1/2" 1/2"
1/2" 3/4" 1-3/4" 2-5/8" 1/2"